This intriguing wartime thriller adapts Vernon Sylvaine's stage play imagining a Nazi plot to kidnap Winston Churchill – a plotline famously revisited more than three decades later in The Eagle Has Landed. 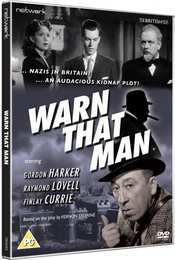 Blending keen suspense and defiant humour in equal measure, Warn That Man sees "professional Cockney" and box office favourite Gordon Harker starring alongside Canadian-born Raymond Lovell and British film stalwart Finlay Currie. Made in 1943, the film is presented here in a brand-new transfer from the original elements in its as-exhibited theatrical aspect ratio.